Patton Oswalt, Timothy Olyphant, and Amy Poehler lead a live reading of the Coen bros’ modern classic. One of the hottest movie tickets in town doesn’t actually include a film screening. It’s Film Independent’s Live Read series in which Up in the Air director Jason Reitman (or one of his friends) gathers a bunch of his well-known actor pals to read a script live, on-stage. There’s no photography or videotaping allowed at these events, so each event is, literally, a one-time only experience. For cinema buffs, it’s like stepping into an alternate universe, one where their favorite flicks are remixed with new actors and presented without images. The words and performances become the centerpiece, while the imagery exists only in your imagination. Last night, the film was the Coen brothers’ Raising Arizona, the outlandish story of a pair of criminals who steal a baby and go on the run. Guest-directed by Patton Oswalt, the Live Read starred Timothy Olyphant as Nicolas Cage’s loveable robber Hi McDunnough and Amy Poehler as his wife, a role originally played by Holly Hunter. Comedic duo Keegan-Michael Key and Jordan Peele read the roles of escaped convicts Gale and Evelle Snoats, while Hellboy and Sons of Anarchy star Ron Perlman played the Lone Biker of the Apocalypse. Michael McKean of This is Spinal Tap and Best in Show played Glen, Hi’s swinging supervisor. Oswalt read the director’s notes, which highlight the incredibly detailed language of the Coens, laying out camera angles, moods, and subtle jokes. The original casting, Oswalt mentioned, was key for the Coens, who took care to give personalities to even the most minor characters. “This reading shows that with different actors in the role, how different the movie could have been,” Oswalt said. He also revealed that one of his family members had a cameo as part of the cast. As a still image of a machine shop was projected on screen, Oswalt pointed to a man in the background hunched over a machine: his grandfather, John L. Oswalt. While many of the actors reinterpreted their characters–like Key and Peele who somehow made their convicts more hilariously idiotic than the originals–while Timothy Olyphant did a nearly perfect Nic Cage impersonation. The key was in the breathing: He stops, starts, continues for a long phrase, then stops again. Poehler’s twang was in overdrive as she dished out “sonnabitches” and breathy sobs. You could see the actors laughing as they reading ahead in the scripts. Poehler’s sobs broke down the stoic Perlman. Key and Peele cracked each other up. Jeff Garlin, who played furniture salesman Nathan Arizona, busted up whenever Key howled. McKean made everyone lose it. The real star of the evening was the screenplay. As someone who grew up in Arizona, the film had a personal connection for me. Though the accents are more Texan than Western, the Coens’ depiction of 1980s Arizona was the landscape of my youth. The Saguaro cacti, the seemingly endless roads chasing that yellow line, the big blue skies. Some of the still images projected on the screen behind the actors were backdrops from my childhood. Nathan Arizona’s house was actually the Phoenician Hotel, where my brother washed golf carts–and golf balls. The convenience store they knock over was a Circle K just minutes from my childhood house. The final showdown between the Biker from Hell and the McDunnoughs was at a terrific BBQ joint, Reatta Pass, which is a replica of a 1950s-style Old West town. 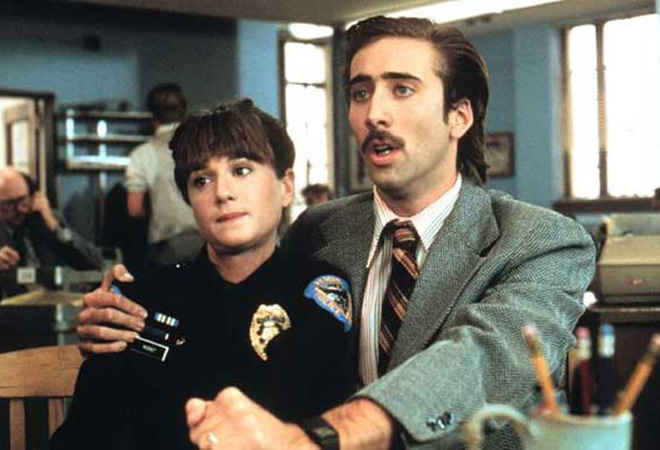 Raising Arizona depicts a lost era in Phoenix, the wide open desert that’s now erased by housing developments, strip malls, and car dealerships. In 1987, when the film debuted, Phoenix still had an edge, a border between the desert and the city. Now, McMansions are scattered throughout the region and the weirdness of the rapscallions who populate it has been homogenized. The Coens’ script captures a West in transition, one where even the outlaws had to evolve.